The Use of γράφω and its Compounds in Eusebius: Origen and Pauline Authorship of Hebrews? 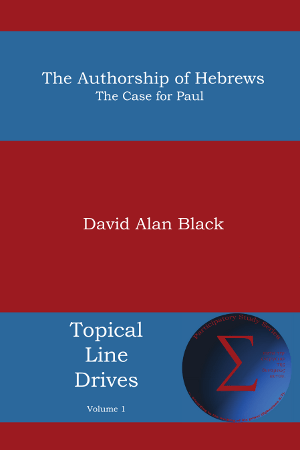 David Alan Black is slated to release a new book contending that Paul wrote the book of Hebrews. It is sure to make some waves in the scholarly field. I highly suggest you read his thoughts on the matter. Even if you are not dissuaded from the entrenched position that Paul most certainly is not the author of Hebrews, it will challenge you. Since we are talking about the issue of the authorship of Hebrews, may I humbly suggest you read my article, “The Use of γράφω and its Compounds in Eusebius“? In his 2001 article “Who Wrote Hebrews? The Internal and External Evidence Reconsidered,” Black argued that Paul was the author of Hebrews and Luke served as his amanuensis. Black uses Origen’s view, cited by Eusebius in his Ecclesiastical History, as support for this position. Alan Mitchell, in his commentary on Hebrews in the Sacra Pagina series, responded to Black. He contends that Origen’s quote is found in Eusebius and that Eusebius prefers a compound form of γράφω (ὑπογράφω, συγγράφω, ἐγγράφω, ἀναγράφω, etc.) when he refers to the act of writing alone. This means that Origen, when he said “God alone knows who wrote ὁ γράφω Hebrews,” could not be referring to an amanuensis since he uses γράφω and not a compound form. Bypassing the question as to whether or not Eusebius’s usage of γράφω and its compounds is relevant to Origen’s quote, I ask whether Mitchell’s analysis of Eusebius holds true. Is there a clear and fast distinction between γράφω and its compounds, or is there a greater degree of semantic overlap than Mitchell allows? The purpose of the essay isn’t to prove Pauline authorship or that Origen thought Paul used an amanuensis. Its purpose, however, is to ask whether Mitchell unnecessarily limits the semantic range of γράφω in Eusebius. This entry was posted in Early Church Writings, Greek and tagged Essays, Eusebius, Origen, Pauline Authorship of Hebrews. Bookmark the permalink. 4 Responses to The Use of γράφω and its Compounds in Eusebius: Origen and Pauline Authorship of Hebrews? Thorough and excellent scholarship Jacob and quite convincing! Thank you! I just bought another a book by another David, David Allen who wrote Lukan Authorship of Hebrews. I have been fascinated for some time on the authorship question. I look forward to Dr Black’s book. i am opened minded about it but I really want to be convinced of Pauline authorship or at least of Pauline origins. Will you be reviewing David Allen’s book on here? I just found this site, good info. I don’t, at the present moment, intend on reviewing either Dr. David Allen’s book on Lukan Authorship or Dr. David Alan Black’s book on Pauline authorship. That might change in the future though . . . we’ll have to see what kind of time opens up for me. I am glad you are interested in the topic. I hope you found my “essay” helpful in clarifying Origen’s thoughts on the authorship of Hebrews. It was fun researching and writing it.